Here's an interesting factoid: In 1954 Walt Disney was looking to build up an amusement park, and while he had bundles of cash, putting up the dozens of rides and attractions he wanted would surely tap him out. In an effort to build a particular attraction on the cheap, Uncle Walt visited the ID department at Pasadena's Art Center "to see if he couldn't finagle the headmaster into getting his industrial design students to create a car ride for his park, free of charge." While Disney failed to convince the headmaster, at Art Center he caught wind of alumnus Bobby Gurr, an ID'er and avid mechanic who "at 23...had already written a couple books on industrial design" and was working for a design firm. 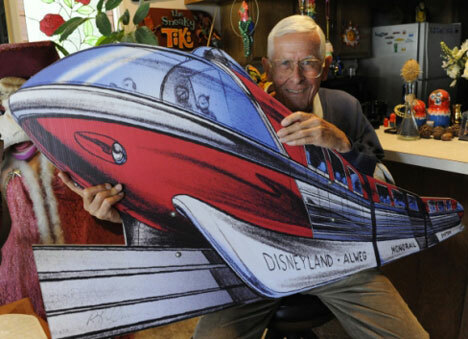 A meeting was set up; Gurr was hired for a two-month contracting gig to design the Autopia car, prompting him to quit his job and set up his own firm; and what followed was a nearly 50-year career designing rides and attractions for Disneyland. Read the entire tale here.